Ingrediens: Sugar Beet, multi-herb and spice mixture, corn starch, acidity regulator (Strict acid). Shelf life:1 year Pack: 30 x 250gr. In box. 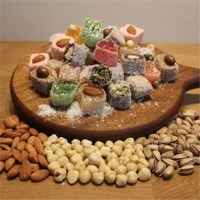 Special mixed turkish delight, turkish delight with pistachio, coconut covered turkish delight with hazelnut, coconut covered turkish delight with peanut, turkish delight with peanut, turkish delight with hazelnut, coconut covered turkish delight with dried figs, apricots and raisins, special stuffed turkish delight, special mixed turkish delight, turkish delight with rose flavoured and mastic, coconut covered turkish delight with pistachio, Strawberry, sour cherry, dogrose flavoured turkish delight covered with coconut, fruit flavoured double roasted turkish delight, fruit flavoured turkish delight, mini turkish delight with mastic, rose flavoured mini tukish delight, fruit flavoured mini tukish delight fovered with crystal sugar, fruit flavoured mini turkish delight, mini turkish delight with pistachio, coconut covered turkish delight with pistachio, coconut covered turkish delight with almond, coconut covered and cacao flavoured turlish delight with pistachio, coconut covered turkish delight with pistachio, coconut covered turkish delight with almond, coconut covered and cacao flavourad turlish delight with pistachio, coconut cevered cezerye with hazelnut. Short on time? 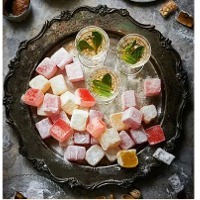 Let turkish-delight sellers contact you.